1More is stepping up their game in the Bluetooth headphones market by introducing a variety of products, including their first noise cancelling product: the 1More Dual Driver BT ANC. These are in fact almost identical (in terms of general design) to the 1More Triple Driver BT, but they’re fairly different when it comes to the design of earpieces; there are also a few key differences due to the addition of ANC technology. The Triple Driver BT are identical to the wired version and include Bluetooth; the same applies for the Dual Driver BT ANC, which are basically a Bluetooth version of the Dual Driver Lightning ANC. Although this is 1More’s second attempt at ANC, the result is really convincing. The design choices made by the company result in a different experience from that of most ANC headphones, but one that has its pros: the open-back design has certainly its perks when it comes to eliminating noise without also cancelling out useful information. Despite my initial worries that this would not be functional, it is actually a new take on the ANC paradigm that works pretty well – especially for commuters, people doing sports and other people who want to drown out the noise while retaining awareness of their surroundings. Disclaimer: a special “thank you” to Tom at 1More Europe for his support and help (and for providing this sample for free). Learn more on the Dual Driver BT ANC on its official product page. 1More uses their usual approach to packaging (thankfully so!) and include a lot of different accessories in the box. In addition to the earphones, the box holds a plastic bag for storage, a set of silicone eartips in five different sizes, three sizes of silicone “wings” that fit on top of the housings and a USB Type-C to 3.5 mm jack cable. The 1More Dual Driver BT ANC is almost identical, in terms of general design, to the 1More Triple Driver BT. In fact, the neckband is the exact same, with a single exception: just beside the power button there is a switch that enables or disables the noise cancelling. The main difference is, however, in the housings. The Dual Driver BT ANC are in fact similar in terms of general shape, but are more clearly cut and with less curved lines. The most glaring difference is the open back, though, as the housings have a hole on the back covered with a red grille. There is also a change in the plastic back that faces the ear: it has big, bold “R” or “L” letters. The strain reliefs are also larger, as they have a microphone inside them (and that’s how the ANC system works!). 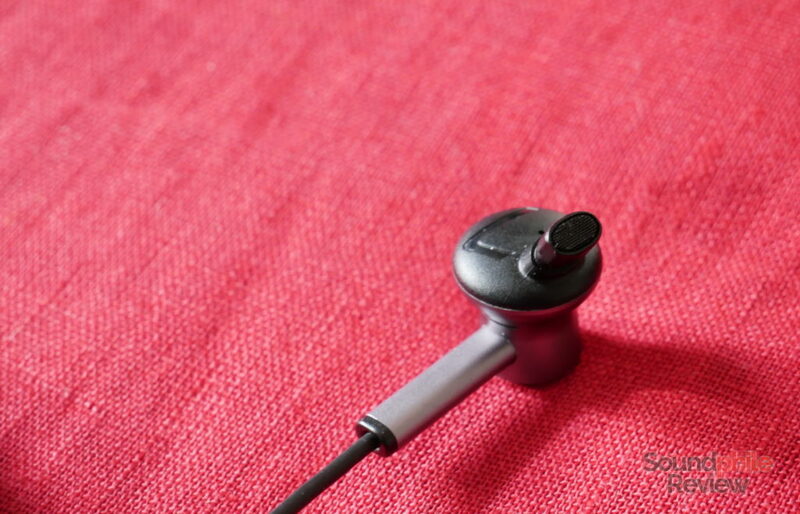 The nozzle is not circular as on most other earphones, but it is oval. This could be an issue when it comes to using eartips with hard inner boring (e.g. foam tips), but it is an otherwise irrelevant change. 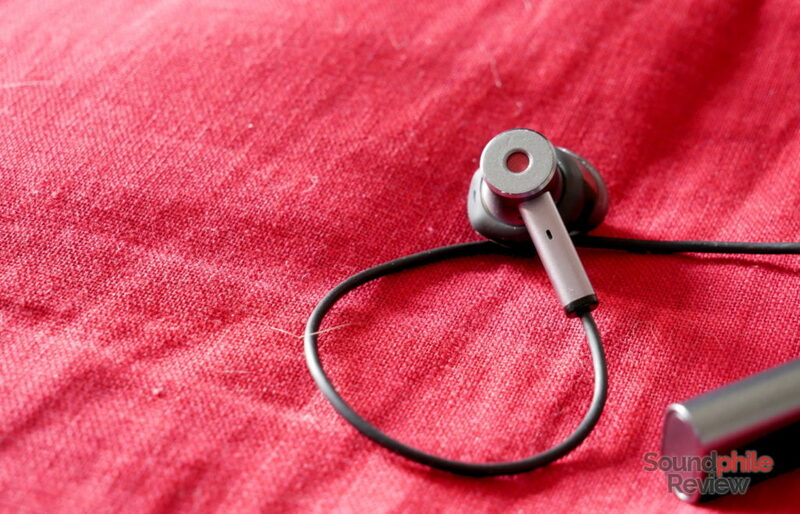 One thing to note is that the box includes a set of additional silicone things – those go around the shell and provide better comfort, isolation and stability, also preventing the earphones from falling off in case you use them while running. They are effective in this regard and really help make comfort better. However, one has to be careful while using them as there is a hole on the side of the shells: that hole works as a vent to avoid pressure to build up inside the ear canal, as that could damage your hearing. One has therefore to pay attention not to cover these holes. 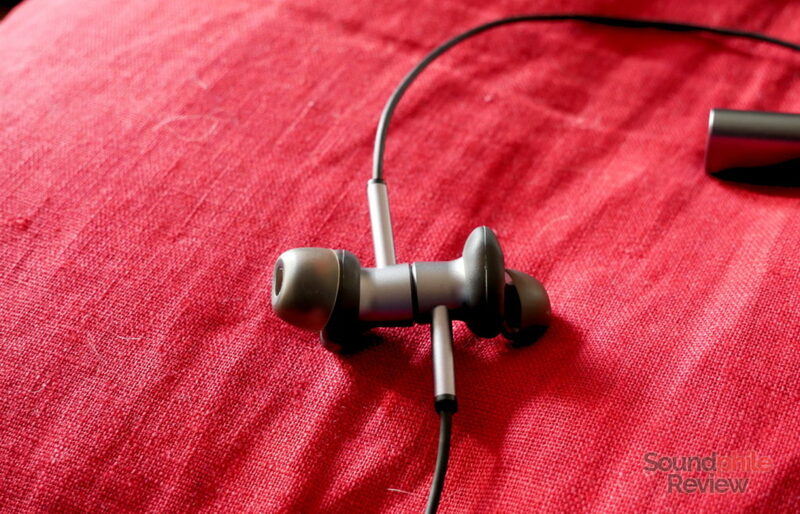 I especially liked the fact that the earpieces are magnetic and are therefore easier to manage as they stay tidy. One could theoretically even have one inside the shirt and the other outside so they would stay in a fixed position. Isolation is close to null, as we’ll see more in-depth in the following paragraph: this is caused by the open back. The good news is that sound does not leak outside, so the Dual Driver BT ANC are safe to use even in noise-sensitive environments such as offices and libraries. The cable is well-made and covered in fabric braiding that should make it resistant to wear and tear. Alas there are no strain reliefs on the USB Type-C side of the cable, so this particular part might be relatively weak. The 3.5 mm jack is TRS, so the earphones can’t be used to call nor can control playback through the integrated controls – they become passive earphones by all means. Although there is no support for the LDAC or aptX codecs, the 1More Dual Driver BT ANC still feature support for the SBC and AAC codecs. This comes on top of the Bluetooth 4.2 standard. The 1More Dual Driver BT ANC uses a feed-forward technique which uses microphones listening to noise coming from outside and then producing opposite waves that counter and cancel the noise. This is not the same technology used in current leading noise-cancelling products such as the Sony MDR-1000X or the Bose QuietComfort 35, as those use a hybrid approach with a set of microphones listening to the outside and a set of microphones listening to the inside. At first I was sceptical about the open-back earpieces: how could they provide the necessary isolation? Would the ANC be effective enough to make up for the loss of passive isolation? How would higher frequencies be kept under control? Thankfully, this design proves really effective, allowing one to enjoy music on the go without the noise and without excluding the important sounds. The open-back design makes isolation extremely poor (almost non-existent) as I initially thought, so using the 1More Dual Driver BT ANC without enabling ANC proves very difficult if the environment is not very quiet. When ANC is enabled, though, low-pitched sounds are almost completely eliminated, leading to most of the sounds one can hear on public transport disappear. The open back can be a good thing if looked at from the right perspective: the sound coming in means that you can listen to music without isolating yourself too much from your surroundings, and that is especially useful in urban environments and if you are doing sports there as you can stay aware of possible dangers (e.g. cars) while also being able to listen to music. There are two different “steps” in using ANC: one is a less effective solution that however uses less power. It is sufficient when there’s not a lot of noise (e.g. a quiet office). The second “mode”, activated by sliding the button a second time, is more powerful but also more power hungry; it is effective in cancelling out practically all of the noise coming from outside and that’s the most interesting mode (so that’s the one you see described in the following paragraphs: almost everything applies to the “mode 1”, but to a lesser extent). The ANC works best with constant sounds. This is why the best testing environment is an aeroplane: it has a constant hum that is easily predicted and therefore easily countered. On the other hand, sudden sounds can’t be countered effectively, as there is no data to create a model of the sound and therefore to counter it. A simple example is the sound made by the metro’s closing doors: the sound is sudden and loud, so the ANC circuitry has a hard time figuring out what to do with that sound. The result is the circuitry basically gives up, and you can hear the sound almost as if you were not wearing headphones. I tried the ANC in a variety of situations, from busy streets to crowded public transports, to aeroplanes too. The result was always more than good. 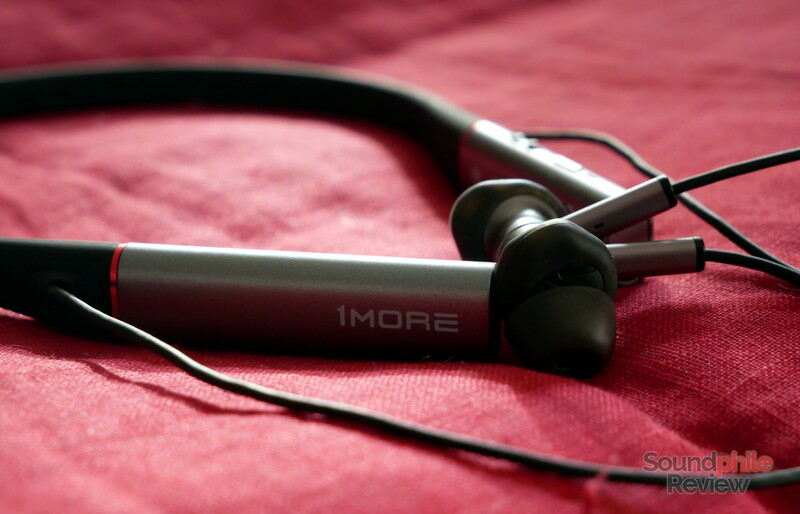 Considering this is the first generation of noise cancelling developed in-house by 1More, the result is quite stunning. The vast majority of the low-pitched hum that usually becomes tedious and even outright annoying in the aforementioned situations is effectively removed by the ANC system, so that it vanishes almost completely. The effect is that of an almost perfectly silent background, which is exactly the aim of ANC. I find it interesting that the system works so well despite the back being open, as this means that this result is entirely due to the ANC and not also due to the passive isolation. There is another good thing to be said about the open back when ANC is on: as the ANC system does not filter out all frequencies, the open back means that there are still sounds coming in. I tested it when on Milan’s metro and found it useful as the noise was drowned out, but announcements regarding the stops were still perfectly audible. What’s nice is that people talking around me were barely audible. Sliding the ANC button upwards activates the “ambient awareness” mode which boosts frequencies that contain the most useful information – voices, cars, other sounds that we find in day-to-day life – and which can be useful if you need to be especially aware of what’s around. 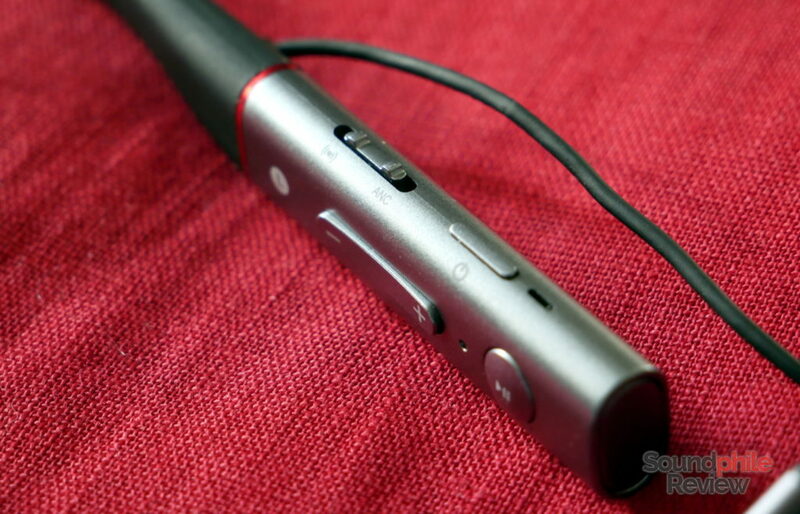 The microphone does a good job and captures the user’s voice clearly even in noisy environments. Although the other person often heard my voice as a bit distant, it was always clear, even when I was not in a perfect environment (acoustically speaking). As I mentioned in the previous paragraph, the 1More Dual Driver BT ANC can be used in wired mode, which is really useful when flying on airlines that are especially strict about not using any wireless device. This is also useful, on the other hand, in case one wants to use the earphones with a source that does not have Bluetooth (I used it with a Cayin N5ii, which has a Bluetooth so terrible it practically does not have it). The headphones have to be on to use them in wired mode, so this mode is alas not useful if the battery runs out. I noticed that the volume is low when using the cable: unless one sets the volume on the headphones to full blast, the volume on the source needs to be raised quite a bit. It’s therefore always a matter of remembering to raise or lower the volume when switching to and from wired mode – not really a flaw and more of a limitation of how wired mode works. Battery life is excellent even when using noise cancelling. The company claims the battery can provide up to 7 hours and that figure is accurate enough. What’s interesting is that this is when using ANC on the second step, so when using it on the first step or when not using it at all, battery life should be even better. Among the sources I used to try the 1More Dual Driver BT ANC are a Honor 9 smartphone, a Cayin N5ii (using the cable), an xDuoo X10T II and an iFi nano iDSD BL (wired, again). The 1More Dual Driver BT ANC are not as well-balanced as their sibling with three drivers. While they strive for balance, they present some key differences that make them quite not the same. It has to be noted that using ANC does not result in any especially noticeable change in tuning; the only significant difference I hear is that the sound loses a bit of clarity, as if it became a bit muffled, and there is a bit of hiss in the background. Soundstage is unexpectedly wide, but it is even more surprisingly deep. It sounds like a very large space where the music is played in and where every instrument holds a specific place. This placement is not overly accurate, but it is enough to get a clear idea of each instrument’s location in a wide space. Instrument separation is, alas, not on par with the rest: in crowded tracks the earphones struggle to keep up with the mix and often let some instruments cover others. I noticed this in multiple occasions, but especially when listening to orchestral jazz (e.g. Snarky Puppy). Bass is just north of neutrality. I would say that it is generally just a bit more than perfectly neutral, though it is not perfectly linear: sub-bass is in fact lacking and noticeably recessed compared to the rest of the lows. More generally speaking, the Dual Driver BT ANC are not basshead territory by any means – quite the contrary, in fact. The good news is that they are in fact good at bass in terms of quality, as the lows are well controlled and never leak over the mids. Speed is good enough to give the sound a bit of physicality and to make transients sufficiently accurate. Midrange puzzled me for a while before I could understand what was going on. I got the impression that something was not entirely right, and I then understood what it was: there are a couple of peaks that can become quite fatiguing with the right tracks. Those peaks are located in the middle of the midrange and in the upper section. They are not especially noticeable, but they can be quite obtrusive if the tracks being played already feature a lot of sounds in those areas. I realised this when listening to Snarky Puppy’s We Like It Here album, especially with the tracks Shofukan and Jambone. The rest of the midrange is quite flat – in a good sense – and even, so it comes out in the mix with the right amount of presence and force. In terms of detail, midrange is more than acceptable but does not expose the finer nuances, as one would expect. Treble is the weak spot in the sound of the 1More Dual Driver BT ANC. It is so because it is not as present, extended and detailed as one would expect it to be. It is especially detail that’s lacking: Massive Attack’s Angel has cymbals and snares that sound a bit blunt, instead of being well-defined. This is nitpicking a bit, as the definition is still good and allows one to hear a lrge part of the details. I think that this is caused by the roll-off, which is quite sharp and limits extension. I would normally offer you a comparison to other headphones, but given the noise cancelling tech and the open back of the Dual Driver BT ANC this seems kind of out of place to me as no direct comparison is possible. However, I will tell you that from a purely acoustic standpoint the 1More Triple Driver BT offer more accurate sound on all fronts and better technical ability, save for the width of the soundstage (which is larger on the Dual Driver BT ANC). Considering the 1More Dual Driver BT ANC are the company’s second attempt at a noise-cancelling IEM (if we consider the identical, but wired, Dual Driver Lighning ANC), they are honestly quite great. Although they do not use the latest technology for ANC, using the relatively old an less effective “feed forward” technique, they do a great job at suppressing noise even in complicated situations. They sound good, offer great noise cancelling and a number of options, so they’re quite a success in my eyes. At this point I kind of wish 1More made a bad product, because they’ve been consistently launching great products that I find no significant flaws in – if they keep on this track, I will have to write a negative review just so that it doesn’t seem like I favour them (I don’t). Considering the price, the 1More Dual Driver BT ANC are absolutely great and a more-than-good option if you are in the market for an affordable Bluetooth noise cancelling IEM.